Red Hill Riders Have A World Champ In Their Ranks! Red Hill Riders have a world beater in their ranks! RED Hill Mountain Bike Riders have a world beater in their ranks. Member Kevin Skidmore rode to victory in the World Endurance Mountain Bike Organization (WEMBO) 24-hour solo world championships. 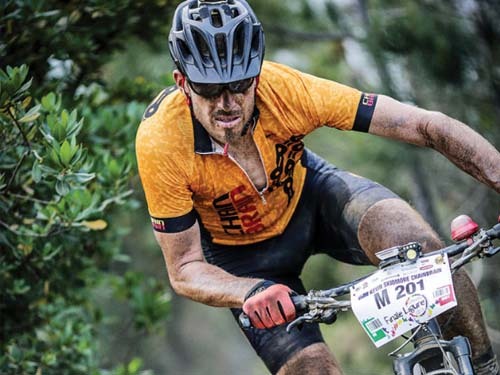 Skidmore, 41, took out the 40-44-year-old male category and finished 10th overall in the grueling endurance event at Finale Ligure, Italy, on Saturday 3 June. He rode 24 hours straight, clocking up 320km over 34 laps of the track which included almost 8000 metres of climbing. “It’s nothing short of insane,” Red Hill Mountain Bike Riders president Mark Gardner said. “There’s never a moment where he can relax and not be on his game. “[Mountain bike riding] is one of the most demanding sports on the planet. It was far from smooth sailing for Skidmore who faced several set-backs throughout the race. He destroyed one of his bikes when he miscalculated a jump early in the race and recalls the “sickening sound of carbon fibre being destroyed”. Later, he tumbled into thorn bushes after stopping on a hill and overbalanced when trying to take off and pass another rider who had stalled on the climb. Then, in the closing stages of the race, Skidmore tangled himself in vines in the forest and broke a brake lever on a second bike. It was a massive win for Skidmore who has recently been competing in the six-hour Victorian Enduro series. Skidmore has been riding bikes for as long as he can remember but took up racing mountain bikes nine years ago and has been a member of the Red Hill Mountain Bike Riders for the past five years. “I never started this with any real ambitions, I just wanted to prove that I could do it,” he said. Skidmore is gearing up for the Otway Odyssey in February – an event in which he missed out on a top-10 finish by only one second this year. Article republished from Mornington News.